Several months ago I received an email from Heathrow Rewards (I’m on their mailing list as a frequent flyer through Heathrow). This email however wasn’t telling me that I can get cheap perfume or reduced commission currency but more particularly about the newly built Terminal 2 and it’s reopening. The email asked for volunteers to test the new terminal. They were looking for four different trial phases to check the parking, signage, flow of passengers, the check-in procedure, security, boarding, passport control, baggage and pretty much everything that you experience at an airport when arriving or departing. The aim of the test phases was to establish that all the routines, training and building works were designed perfectly for the many thousands of people that would be traveling through Terminal 2. More importantly that any ‘problems’ (teething or otherwise) could be resolved before the terminal is open to the public. Volunteers would be rewarded with a poke around the new Terminal and a promise of a wonderful goody bag after every trial. 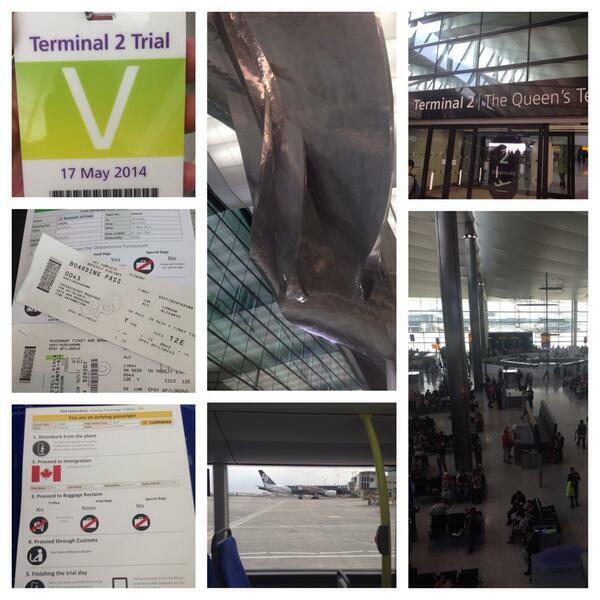 I was intrigued as to what was really involved in an airport trial. I already do customer reviews of restaurants, hotels, leisure/sports facilities, physios and bars looking at the customer experience so wondered how this would be different. Sadly I was only available for one of the trial dates, the final date – today. For the past few weeks there have been automated emails advising me a little of the procedure for the day. Registering for a car parking pass, instructions for parking and a little more about what to expect. In the last week, I’ve received emails telling me how well the project is going and how the trials have helped iron out teething issues raised. Apparently there have been over 800 issues raised through these trials and 620 of these have already been resolved. Let’s see how they do today! The first group of arrivals were called for a briefing where the day was explained to us. During this briefing there was mention many times that we’d have a fabulous day. Pet hate… don’t tell me, let me decide if it’s a fabulous day thanks! Then we left the briefing and headed for the next ‘briefing’ stage where we were given our first assignment scripts. My script indicated I was a gentleman passenger flying alone to Taipei via Bangkok. Flying with Eva Air. I had to collect a trolley and then pick up two pieces of hold luggage. Checkin at a desk and then head through security to the departure lounge and wait my flight to be called. My flight time at 1pm and boarding time approximately midday. The collection of the trolley, locating my two pieces of luggage, checking in and even security went very smoothly. (I’m a particular fan of the bigger security trays in T2). In fact I’d say I flew through all of this and then had time to kill in the lounge. Heathrow had laid on lots of drinks, snacks, muffins, chocolate bars, yoghurts and magazines to keep us fed, watered and occupied. Also traveling around the terminal were magicians, caricature artists and balloon makers as well as some arts and crafts competitions for the younger trial testers. I was chatting to a lovely gentleman who’d done two of the previous trials and was happy to do the final one to see the end results. He told me of a few of the things they’d picked up before and also of the contents of the goody bags (alarm clocks, travel plugs etc). Fortunately for me, he was also on the same flight journey and knew the ropes! At about 11.30 there was a short presentation about the airport, a short speech from Brian Woodhead, Operations Director at BAA. 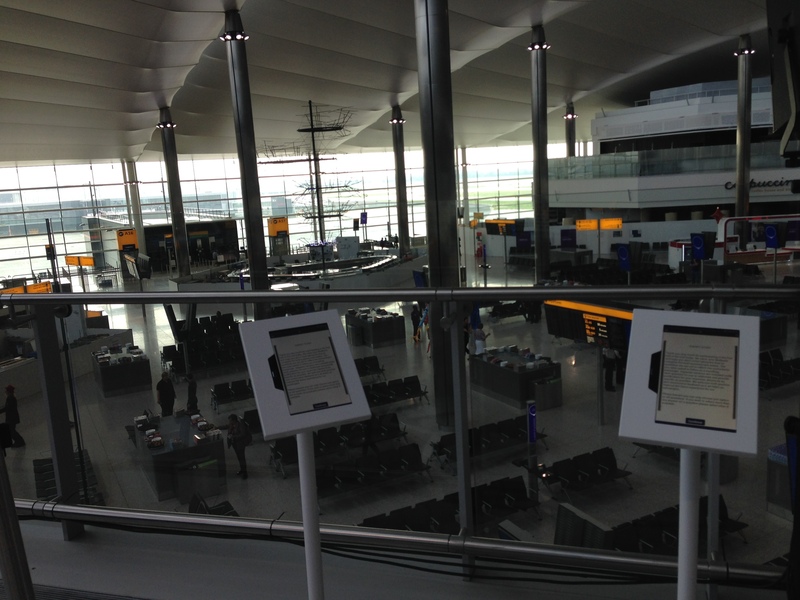 We learnt a little more about Terminal 2. 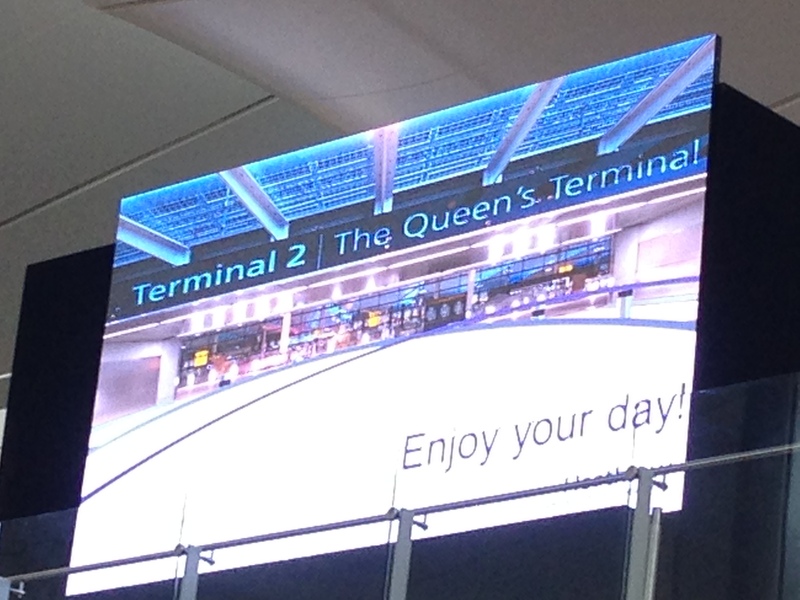 How the original Terminal 2 (AKA Queens Building) was opened by Prince Philip and Queen Elizabeth some 60 years ago and on 23rd June 2014 they will return to open the new Terminal 2. We were then encouraged to take part in a short film about Terminal 2, dancing, singing and generally smiling that will be cut into a music video as part of the promotional film and also include other clips from the day and previous days. As soon as this finished, our flight’s boarding gate appeared. Oh but we were also encouraged to pick up our packed lunch and take it with us on the journey. However the queue to pick up lunch was mahoooosive and many of my flight companions decided to grab lunches after this flight and before the next. Oh how we’d regret that decision! We headed off in search of our boarding gate. 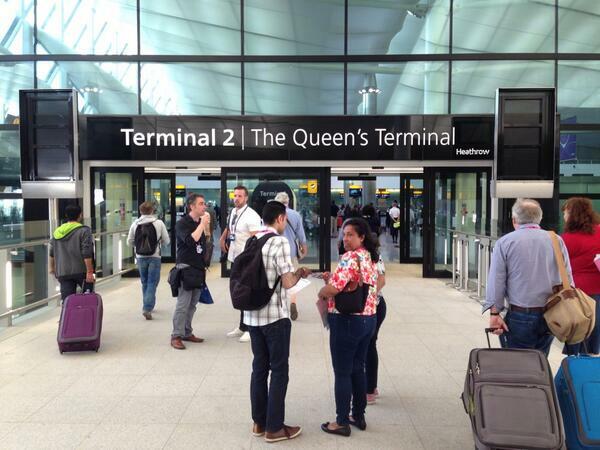 Yes you know it – it’s the furthest gate to get to. Truly it is. A long long way, up escalators, double backing on yourself at different levels, walkways and tunnels and eventually to this bank of departure gates. It all looked very pleasant and functional. I’m not sure if there’s enough seating if the airport departures were at full capacity but they must have done their sums. Also a word of warning for anyone with weak bladders, small children or elderly travel companions – there’s quite a distance between toilets so go when you have the chance! It was minutes until our flight was called and we were going through. Oh except we didn’t really get a flight to Bangkok or Taipei! Once through the gate we get to swap our flight instructions for those of an arriving passenger. This time I’m a young(ish) woman and arriving into Terminal 2 on a flight from Warsaw. Our instructions are that the flight was meant to arrive into Terminal 1 but due to lack of gates arrived here and we were then to make our way through to Terminal 1 arrivals to continue our journey. Or so we thought. Off we set. Down the escalators, along the passenger tunnel, round the corner, along travelators, following signs the whole way. Down another set of escalators and then we stop. There’s a queue. Quite a long queue and it goes around the corner in the tunnel. It’s getting hot down there. We’re not sure where we are. There’s no seats. It’s getting hotter. There’s no toilets. It’s getting hotter still. After quite a while a member of staff approaches our section of queue and advises us there’s an ‘incident’ and we’ll be moving along shortly. They then go further back up the queue and tell the same tale. Some time later, they return with others carrying bottles of water. Once again we’re advised that there’s an incident but this time we’re told that the firemen are dealing with it. Once again this message is told many times to differing parts of the queue. I make a comment that perhaps the PA system isn’t working in the passenger tunnel hence the individual Chinese whispers. All the time it’s getting hotter, people are now in search of floor space to sit down, some are getting worried that we’re cramped together in a passenger tunnel with nowhere to go but most of all it’s hot and we’re hungry (remember we didn’t have time to pick up our lunch). Another chunk of time later we’re told that there’s one of the new air conditioning units has caught fire and although the fire is out, it is bellowing out pungent black smoke. This means that noone can get down the passenger tunnel and out of the location we’re being held in. Hmmm I think our testing may have found a flaw – surely there must be an alternate way out? After another period of time we’re told that we’re going to be ushered back to the departure gates to await further instruction. Fine for a trial but in ‘real life’ you wouldn’t have arriving passengers mixing with departing passengers without going through security! I won’t bore you with all the detail but suffice it to say that there was a lot of scurrying around by staff with perplexed faces and a few muttered swear words too. We were told to find a seat and then told we needed to evacuate the area and were once again bunched up waiting for an exit from this area, minutes later told to take a seat again. What a complete mess. Seriously, if this was the final ‘live trial’ I’m wondering what training has taken place or are the staff also ‘test volunteers’? Soon we were again told we were on the move and OK to go. We went back down another set of stairs, apparently enroute back to the departure lounge. A long walk and several travelators, one of which came to a juddering halt with us on it. When we were all underground once more (different area to the last disaster) we came across two escalators and two lifts which would apparently take us back upstairs. 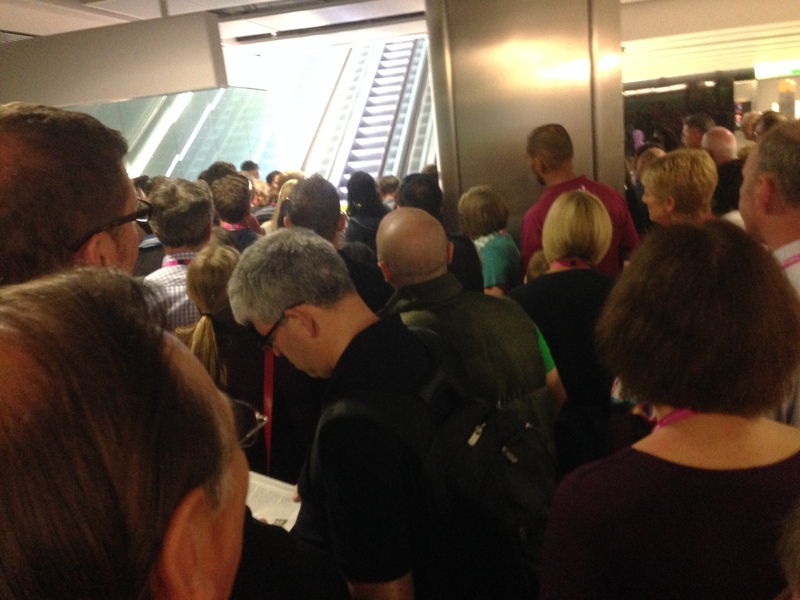 Only one escalator and one lift were working…. eventually (yes you guessed it) the only escalator working stopped. We bunched up again, the staff member who was meant to be assisting us was heard to say “F’ing Hell”, an engineer turns up and attempts to reverse the escalator that isn’t running and fix the one that’s stopped. This takes yet more time and eventually although he gets both working in an upward direction, proceeds to only let groups of 20 or so people on to the escalators at each time. It is quite some time later still that we find ourselves back in the departure lounge… and in search of that illusive lunch that we’d stupidly not queued for earlier! After stuffing a few bites of a sandwich we were on our way again. Back in character and as if arriving from Warsaw. 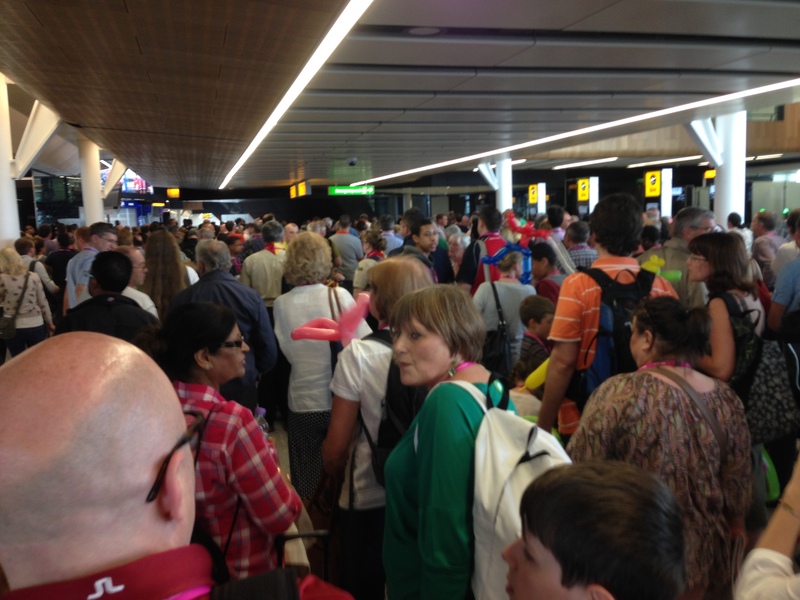 We needed to get to passport control and then to head toward Terminal 1 arrivals area. When eventually we reach the passage way to the Terminal 1 arrivals, we’re greeted by security who advise us that the test member of staff has had to go elsewhere due to the fire. There would be no further instruction scripts and that the trial has now ended early. We headed for the exit. I was desperate to breathe air. 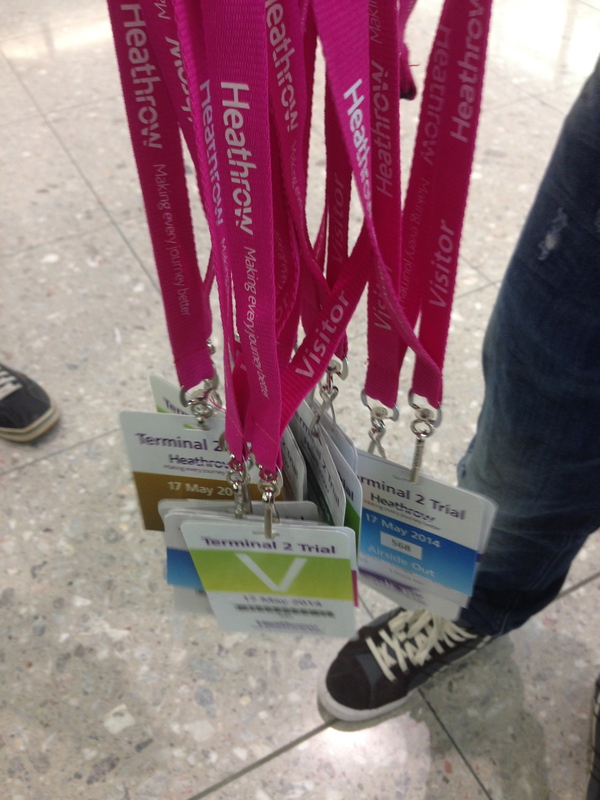 We were stopped only briefly to have thrust in our hands a slip of paper with the url to provide feedback from today and our goody bags… or should I say a Terminal 2 umbrella and an empty Heathrow nylon bag. That’s all we got for the day… well apart from claustrophobia, heat exhaustion, tired feet and a feeling that we could have been doing something so much more interesting instead. 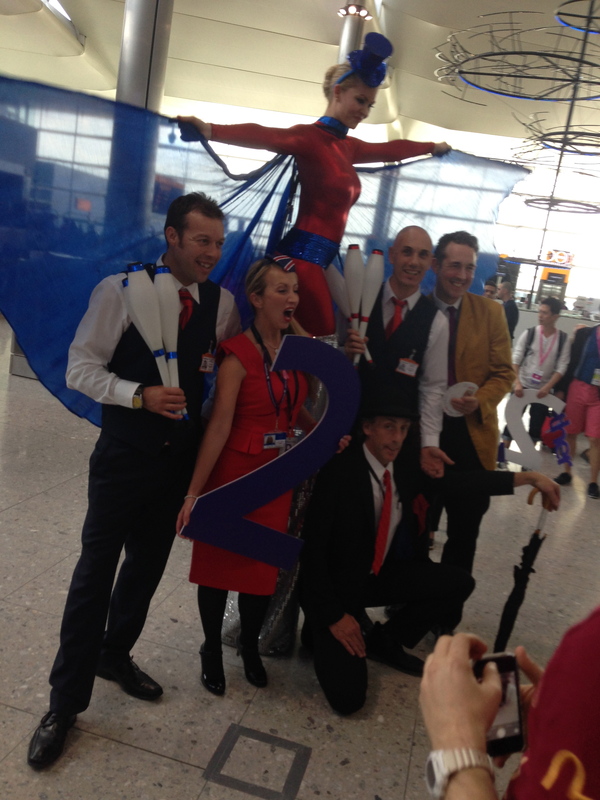 The ‘bosses’ were there and shouting about Terminal 2 when it was going well… didn’t see them again later on. If the passenger tunnel was the only route or arriving passengers at Terminal 2, what would happen if this event happened in normal business day? Or perhaps a passenger was taken ill in the tunnel? Surely there’s an alternate route? How would it work if planes were constantly landing and disembarking yet more passengers into this tunnel? Why did the staff not know how to communicate with the ‘passengers’? Was there any communication amongst the staff to relay the procedure and manage the situation? That’s a lot of dissatisfaction in return for an umbrella and nylon bag. And finally… is it really going to open in a few weeks time? 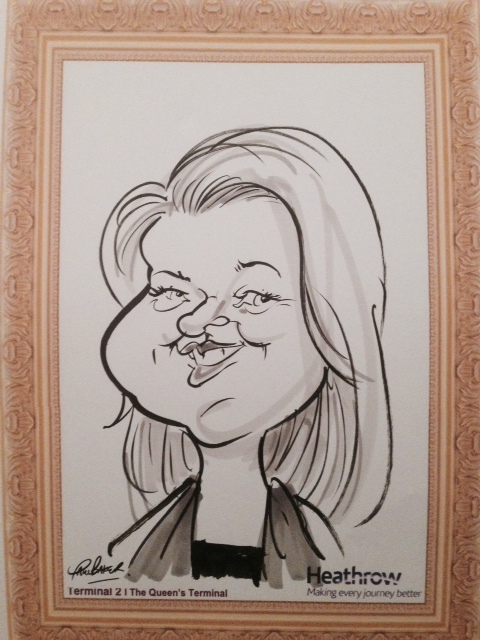 This entry was posted in Living, Volunteering and tagged Travel by AnnaGoAnna. Bookmark the permalink. Blimey sounded a horrendous day for you and little for it. It was a long long day. So disappointing. Still haven’t sent your reward money to Bristol yet ,will be able to give it to you in the flesh in London. Love all your writing and looking forward to seeing you soon which helps take sadness from next news…. Cancer has gone to stage 3 so i will be living in Bloomsbury (mainly free )for 6 weeks starting in a month or so whilst they try to wangle some more years using gadgets. Very tempted to ask them to let you supervise them but probably more fun if we can do some urban walking together. Am due to be in Macmillans 4 star hotel and allowed to have adventures if up to it. I’ll reply to you via email now.